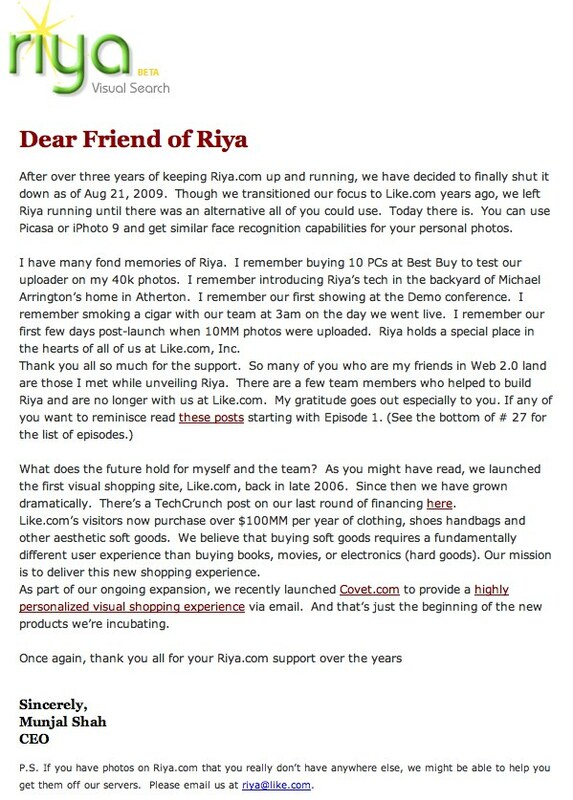 Facial recognition service Riya will shut down on August 21, 2009, says founder Munjal Shah in an email to users this morning. We are adding it to the TechCrunch DeadPool. This was one of the original services that defined the early Web 2.0 movement. We first covered it, then known as Ojos, four years ago. The service changed its name to Riya before launching at a party, yes, in my back yard. Here’s our fist full overview of the Riya product, which helped users by auto-recognizing friends in photos and tagging them. The company came close to selling to Google, but the deal never closed. And eventually the company refocused its efforts on visual search ecommerce (and is still going strong at like.com). The email is below. Thanks for the tip, Orli.